2) Treat already rusted steel & rusting metal & stop the progression of rust. 4) Restore plastic primer to panels & parts to promote adhesion between the plastic & the paint ensuring permanent repairs. 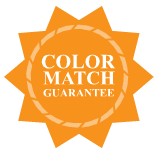 5) Restore color that has been removed using original factory O.E.M exact match paint. 6) Restore, shine & seal paint color using factory gloss clear to get long lasting permanent repairs.